I decided the other day I wanted to make a big pot of chicken and dumplings for dinner. The problem being, I haven't had them in years (probably since the last time my Daddy made them while I was still living at home). I scoured my sizable cook book collection for a recipe. I only found 3- and they all called for rolled dumplings. That wasn't what I wanted. When Daddy made them, he made pillowy, soft dumplings that floated on the top. Finally, I did what I should have done in the first place...I called my Daddy. Much to my shock and dismay, the dumpling recipe was simple. Bisquick, milk and a little sugar. That can't be right! Bisquick! Absurd! But, I figured if I wanted to recreate the dish exactly, I would have to use it. Chicken and dumplings, as it turns out, is very simple to make. I seasoned a cut up chicken with salt, pepper and poultry seasoning, put it in the crock put with enough water to cover, popped it on low and left for school (7:30ish). About 4:15, I took the chicken out, shredded it off the bone (which was really easy since it was falling apart), and put it in my big soup pot. Then I poured the liquid out of the crock pot on top, put a bag of frozen veggies in (I won't use frozen carrots again- I don't like the texture) and brought it up to a boil. A cornstarch slurry was used to thicken the mixture a bit, then I mixed some bisquick, milk and a pinch of sugar til it looked like biscuit dough, but a little wetter. I spooned the dumpling batter on top of the chicken stew mixture, put the top on the pot, and 25 minutes later, I had a whole big pot of pure love. 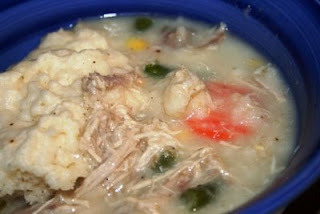 There isn't much better on a cold night than a big bowl of steaming hot chicken and dumplings. I will be making this again...SOON.